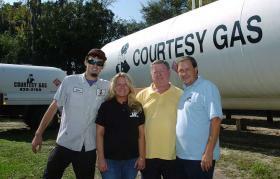 Since 1950 Courtesy Gas has been proud to serve the St. Augustine area with quality propane and professional service. We offer many different type of services so give us a call and see what we can do for you. If the Jones family didn’t get along, Courtesy Gas would just be another local business that faded away. Instead, the provider of propane and related accessories is still serving customers more than 60 years after its founding. A visit to one of the company’s three offices could result in meeting a member of one of three generations of the Jones family. Most of the 10 employees are related by blood or marriage to Steven “Stan” Jones Sr., who purchased the business from his father-in-law in 1974. While the day-to-day operations are mostly left to his children and grandchildren, Jones still keeps a hand in things. A cancer survivor, Jones said he likes to stay involved but trusts the younger generations to keep things rolling. The rest of the family is committed to doing the same thing. Debbie Jones Bailey, Stan’s daughter, is the office manager for the South Rodriguez Street office. Steve Jones Jr. is operations manager for the company. Also, his wife, Misty Jones, and sister-in-law Debbie Jones work for Courtesy. Not every employee has to be part of the Jones family, though. Teir Blake is head service technician, who has been an employee for 20 years. He’s mostly treated as if he’s part of the family. “It’s a good family to work for. It’s enjoyable,” he said. Jones Bailey said the family works well together despite the occasional disagreement. Since they all have the same goals of serving the customers and growing the company, there usually aren’t any major issues, she said. Some of those kids are already part of the business. Among Stan’s grandchildren who are current employees are Tyler Glisson, Jeremy Budd, Zachary Budd and Steven Jones III. Jones III said he’s glad to carry on the tradition in the propane business. “We all come to work with a smile on our faces,” he said. Of course, it takes more than grins to keep a business viable. Jones Jr., who now acts as the main manager of Courtesy Gas, said the formula for success has been treating customers the right way. “Our customer turnover rate is almost zero,” he said. Serving what is still a relatively small town, Courtesy offers a variety of services. The company will do something as simple as filling a tank for a gas grill to installing a propane-powered back-up system to adding a propane pool heater. They also supply propane to area farmers that use it to power their equipment. “We work on everything and we fill everything,” Jones Jr. said. “We’ve always provided service over the years. Because Courtesy has been around for so long with the same family in charge, the Joneses said they get to know many of the customers personally. For some people, that creates level of comfort that’s difficult for larger companies to replicate. “I’ve always said we’re big enough to serve you but small enough to know you,” Stan said. “When people call for me or for Steve and they get us, they like that,” Jones Bailey said. Growing the business means more than answering phones, though. Jones Jr. said the company is always looking to grow the business. They have already added an office to serve Palatka, and Jones Jr. said he’d like to expand the office at South Rodriguez to include a showroom for gas-powered appliances, heaters, grills and the like. He’d also like to have a pump system to fuel propane-powered fleet vehicles. The family has been cautious about investing, working hard to avoid debt. That’s helped them weather the difficulties of supplying a product that can have wild price fluctuations, even at the wholesale level. You can count on Courtesy Gas to meet your propane needs reliably. We can supply propane for anything from forklifts to drying grain on the farm. An endless supply of hot water, whenever you need it—even for multiple tasks at the same time. Join the Revolution!